Been a while since I’ve had much to write about but I’ve gotten on the ice a couple of times and would like to share a little about those trips. A mild fall and warmer than normal November and December delayed the formation of safe ice on Big Horn Lake. By late December, just before Christmas, 4 inches had formed in the Horseshoe Bend area. My fishing buddy and I put together a game plan with a starting location and time limit at that location if we got no bites. 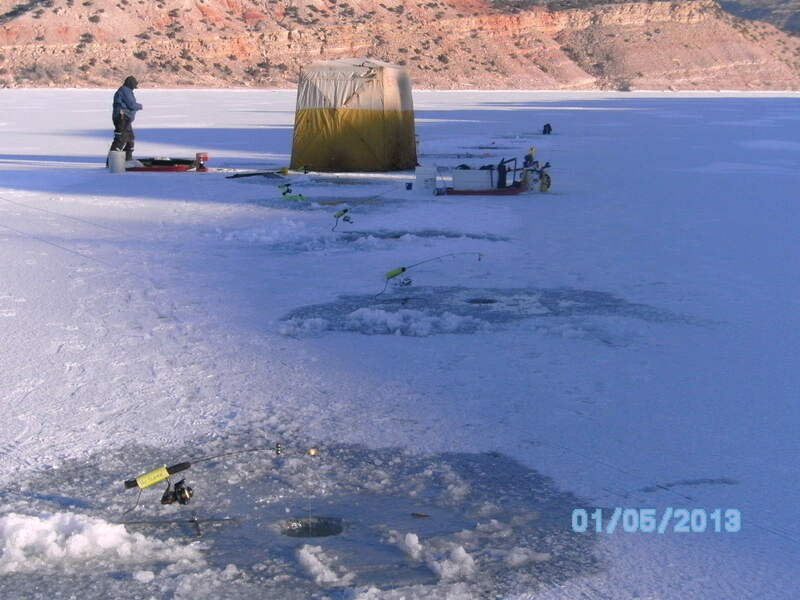 Once on site we made sure that the reported ice thickness was accurate and then hit our first spot. Long story short, we finally got some action at our third location, picking up some really nice sauger, ling and a catfish over 4 pounds. The lesson of the day came from the largest sauger I put on the ice. I was preparing to take some photos of it when it regurgitated a two inch catfish fry! This tibit told us that the fish were feeding on fairly small baitfish and that we should be using smaller minnows. Our second trip this past Saturday was awesome! Lots of people out catching fish, enjoying the sunshine and enjoying the great outdoors. We landed 10 sauger and 6 ling. The first sauger on the ice was Mark’s largest of his fishing career, a beautiful 25 inch fish which he released after some quick photos. We used our time Saturday to test some different rigging setups we hope to improve our catch rates at an upcoming ice fishing derby on Boysen Reservior. If we have some good luck I’ll let you know. I’ll be at the Great Rockies Sport Show in Billings on this Saturday, come say “Hi” if you see me! Til next time….Be Smart and Be Safe!